CRIMSON Lake-liveried ‘Princess Coronation’ No. 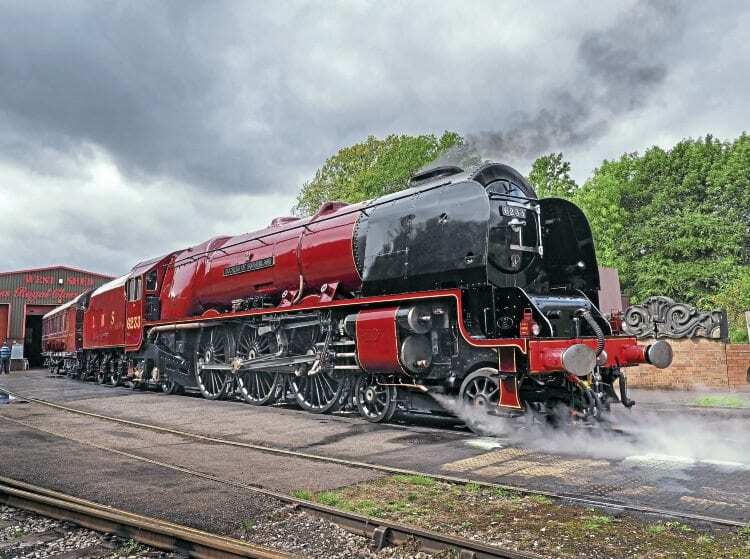 6233 Duchess of Sutherland made its post-overhaul debut during a special unveiling at the Princess Royal Class Locomotive Trust’s (PRCLT) West Shed at Swanwick Junction on September 9, just eight days after its first steaming. running-in trials at the Midland Railway-Butterley before departing on September 19 for the Severn Valley Railway’s Autumn Steam Gala. They were the first runs made by the Pacific since withdrawal in October 2017 and the completion of its £150,000 overhaul. The ‘Duchess’ will follow its Severn Valley appearance with visits to the Swanage Railway’s gala on October 12-14, and the East Lancashire Railway’s Autumn Steam Gala the following weekend – October 19-21 (RM Sept).